Scientists who announced that sub-atomic particles might be able to travel faster than light are to rerun their experiment in a different way. This will address criticisms and allow the physicists to shore up their analysis as much as possible before submitting it for publication. Dr Sergio Bertolucci said it was vital not to "fool around" given the staggering implications of the result. So they are doing all they can to rule out more pedestrian explanations. Physicists working on the Opera experiment announced the perplexing findings last month. Neutrinos sent through the ground from Cern (the home of the Large Hadron Collider) in Geneva toward the Gran Sasso laboratory 732km away in Italy seemed to show up a tiny fraction of a second earlier than light would have. The speed of light is widely regarded as the Universe's ultimate velocity limit. Outlined first by James Clerk Maxwell and then by Albert Einstein in his theory of special relativity, much of modern physics relies on the idea that nothing can travel faster than light. For many, the most comforting explanation is that some repeated "systematic error" has so far eluded the experimenters. Since September, more than 80 scientific papers about the finding have been posted to the arXiv pre-print server. Most propose theoretical solutions for the observation; a few claim to find problems. Dr Bertolucci, the director of research at Cern, told BBC News: "In the last few days we have started to send a different time structure of the beam to Gran Sasso. "This will allow Opera to repeat the measurement, removing some of the possible systematics." 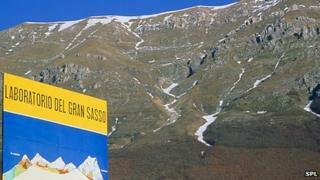 The neutrinos that emerge at Gran Sasso start off as a beam of proton particles at Cern. Through a series of complex interactions, neutrino particles are generated from this beam and stream through the Earth's crust to Italy. Originally, Cern fired the protons in a long pulse lasting 10 microseconds (10 millionths of a second). The neutrinos showed up 60 nanoseconds (60 billionths of a second) earlier than light would have over the same distance. However, the time measurement is not direct; the researchers cannot know how long it took an individual neutrino to travel from Switzerland to Italy. Instead, the measurement must be performed statistically: the scientists superimpose the neutrinos' "arrival times" on the protons' "departure times", over and over again and taking an average. But some physicists say that any wrong assumptions made when relating these data sets could produce a misleading result. This should be addressed by the new measurements, in which protons are sent in a series of short bursts - lasting just one or two nanoseconds, thousands of times shorter - with a large gap (roughly 500 nanoseconds) in between each burst. This system, says Dr Bertolucci, is more efficient: "For every neutrino event at Gran Sasso, you can connect it unambiguously with the batch of protons at Cern," he explained. Physicist Matt Strassler, who raised concerns about the original methods, welcomed the new experimental design. Writing on his blog, Prof Strassler, from Rutgers University in New Jersey, said: "It's like sending a series of loud and isolated clicks instead of a long blast on a horn; in the latter case you have to figure out exactly when the horn starts and stops, but in the former you just hear each click and then it's already over." The re-jigged neutrino run will end in November, when Cern has to switch from accelerating protons to accelerating lead ions. Opera scientists hope to include these measurements in the manuscript they will submit for publication in a scientific journal. One of the main challenges to the collaboration's work comes from Nobel laureate Sheldon Glashow and his Boston University colleague Andrew Cohen. In a recent paper, the physicists argue that if neutrinos can travel faster than the speed of light, they would rapidly lose energy, depleting the beam of more energetic particles. This phenomenon was not seen by the Opera experiment. Dr Bertolucci called this study "elegant", but added: "An experimentalist has to prove that a measurement is either right or wrong. If you interpret every new measurement with older theories, you will never get a new theory. "More than a century ago, Michelson and Morley measured the speed of light in the direction Earth was moving and in the opposite direction. They found the speed was equal in both directions." This result helped to spur the development of the radical new theory of special relativity. "If they had interpreted it using classical, Newtonian theory they would never have published," said Dr Bertolucci. Next year, teams working on two other Gran Sasso experiments - Borexino and Icarus - will begin independent cross-checks of Opera's results. The US Minos experiment and Japan's T2K experiment will also test the observations. It is likely to be several months before they report back. Does it mean time travel is possible?